From Alajuela, heading in a steady climb to its summit at 9,000' above sea level, the Poás Volcano is one of the three volcanoes in the continent accessible by road, and is considered among the largest craters in the world. Along the way, you will watch the colorful scenery of the countryside that includes; coffee plantations, strawberry fields, and ornamental plant greenhouses. Once at the volcano, you will walk through the only true dwarf cloud forest in the country, brimming with native plant species, and marvel at the spectacular views of the smoking crater and crater lake. After visiting the volcano, you will enjoy a delicious lunch in one of the typical restaurants of the area before continuing on to beautiful Grecia. Considered one of the cleanest towns of Latin America, it is home to the only Metal Church in Central America and a national monument that fills its inhabitants with pride. In order to catch a glimpse of local culture there is a scheduled visit to the Central Market. Doka Estate is a working coffee farm located in the coffee capital of Costa Rica, Sabanilla, Alajuela, on the rich and fertile slopes of the Poás Volcano. The farm belongs to the Costa Rican Vargas Ruiz family, coffee production pioneers for over 70 years. Their unique THE DOKA ESTATE COFFEE TOUR gives you an opportunity to experience the cultivation, harvesting and processing of one of the most important sources of the development of Costa Rica: Coffee “The Golden Bean”. 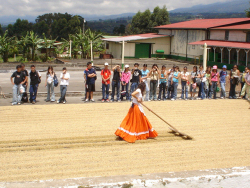 The main objective of the Coffee Tour is to educate and inform local and international visitors with regards to the whole production process as well as the processing of coffee. The tour takes place on the Doka Estate, where you can learn about the production, the harvesting, the processing plant and the roasting of the grain. The last stop is the colorful town of Sarchi, known as the Cradle of Costa Rican Artisans because of its fine workshops. Here you will have time to enjoy the artistic work of the local artisans as they create the famous typical oxcart, kaleidoscope-colored replicas of the country's original coffee bean truck. There will be time to shop for that special souvenir to take home. 6-7 hours. We recommend: light jacket, comfortable shoes, binoculars and camera.